What makes a dive trip really special is when you see something underwater for the very first time. Malaysia’s Perhentian Islands didn’t disappoint me on that score – it was during a dive at D Lagoon, one of the simplest, shallowest coral reef dives possible on the Perhentians, that I got to witness the arrival of a school of humphead parrotfish. They turned up just at the end of our dive like a gang of Hell’s Angels taking over the reef – there were easily 20 to 30 of them and I was taken aback at just how big they were. Over half a metre in length, the humpheads clustered together and repeatedly attacked the coral itself, chomping away and sending out clouds of debris which soon muddied the water. No diver would want to get in the way of their powerful beaks. I’d never seen humpheads in real life before and couldn’t stop marveling at their size and the slightly comic appearance their beaks gave them, which seemed fixed in a perpetual mischievious grin. Back on board the boat, there were similarly broad smiles from the divers too. It may not be Malaysia’s most superlative dive destination, but diving in the Perhentians is always full of surprises. A half hour speedboat ride off the the western coast of peninsular Malaysia, the Perhentian Islands are an increasingly popular scuba destination that sees a lot of divers returning several times after their first visit. It’s not difficult to see why: the Perhentians are blessed with the archetypal white sand and palm trees of a tropical paradise and their beauty on land is matched by what lies beneath the water too. Best of all, the Perhentians are relatively easy to get to and extremely affordable too – this is one dive holiday that won’t break the bank. It’s this combination of idyllic beaches and low prices that has driven the Perhentians’ rise in popularity for divers and non divers alike over the last five years. The islands attract a diverse mix of Singaporeans on weekend breaks, Chinese package tourists coming for some sea and sand, and a swathe of European backpackers on their South East Asian travels. There’s little sense of being amongst a crowd however – during my stay in June, the small beaches remained pleasantly empty and the dive sites were usually uncrowded too. Despite the Perhentians’ growing popularity, there’s still a sense of discovering somewhere that not many other people know about when you first arrive on one of the islands’ beaches. That sense of discovery is compounded by the islands’ quite modest infrastructure. While you can get mobile phone reception, there’s no high rise buildings, no roads and no ATMs on the two islands that make up the Perhentians – there are a couple of tracks through the jungle that link several of the beaches, but otherwise the only way to get between them is by boat. Long Beach on Perhentian Kecil, where I stayed, is the more backpacker orientated beach and so a bit of a party zone, while the beaches on the bigger Perhentian Besar are more family orientated and quieter. Whichever beach you go to, you’ll find a picturesque mixture of wooden huts serving variously as accommodation, beachside cafes and dive shops. There are several dive operators on the Perhentians, and some have been there for over a decade. The dive schedule follows the laid back attitude of the islands’ beach life – first dive is at 8.30am, second dive at 1.30pm, with journeys to the dive sites in simple wooden skiffs taking around 20 minutes. The boat comes back to shore between dives. 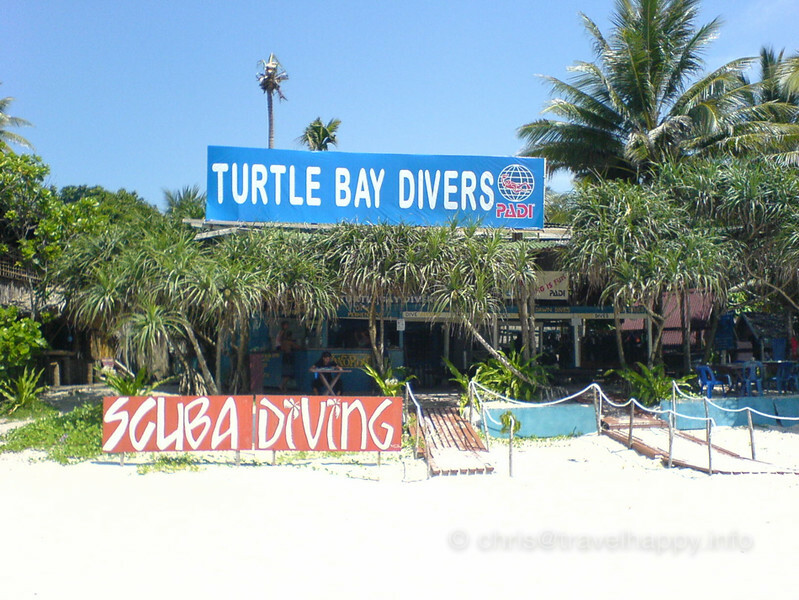 Night dives can be arranged for those interested, and there are also dive day trips organised to nearby Palau Redang, besides the usual array of dive courses for those looking to learn diving or further their dive skills. The calm, shallow waters of the Perhentians makes it an ideal place to learn to dive – few of the dive sites go below 25 metres and most of the interesting stuff is at 18 metres and above. But the Perhentians are much more than just a training ground. There is an abundance of marine life here, with snorkellers enjoying regular sightings of turtles and black tip sharks without even leaving the surface of the water. The repeat business of many divers returning to the islands from all over the world attests to the diversity of their dive sites. There are around 10 dive sites around the islands which will keep novice and qualified divers alike entertained for the best part of a week. Amongst these feature two wrecks, the Vietnamese wreck which is upside down in around 24 metres of water, and the Sugar Wreck in 18 metres, which lies on its side with its two loading cranes still attached strewn out over the sandy bottom. The cranes provide a home for several lionfish and a school of razorfish, which hover vertically and nose down over the battered steel struts. The visibility at the Perhentians varied quite dramatically from day to day during my stay, and on my dives on both wrecks we only had around 7 metres viz – but that didn’t hamper our enjoyment because once on the wreck all the marine life was hovering around the sides of the sunken ships, clearly in view. That said, big cobias have been known to turn up out of the blue, so it’s worth taking a look away from the wreck every now and then. The Sugar Wreck has large cargo doors in its now vertical deck that can be penetrated, while the Vietnamese wreck’s upside down profile means that there’s a large confined space between the boat’s deck and the sandy bottom, which is easy for divers to negotiate. It’s also a haven for schools of fish, allowing them to sit out of the current that flows around the wreck – and, bizarrely, for some of them to be upside down too! Big marble rays have also been spotted lying on the sand in here, so divers need to take care both to spot these beautiful creatures and to avoid coming to harm from their barbed tails. Outside the wreck, baby barracuda hang in the current and tiny yellow boxfish fuss around the broken metal. Besides the wrecks, Tirumbla Tiga (universally known as T3) and The Pinnacle (also known as Temple), are the other two star attractions of Perhentians diving. T3 is made of three huge fingers of rock rising from 20 metres to the surface with a profusion of smaller boulders strewn around them, creating an aquatic labyrinth that even the local divemasters joke about getting lost in despitediving the site hundreds of times. This jumble of rocks and coral makes for some exciting swimthroughs too, and its nooks and crannies provide ample shelter for many critturs. Like many other Perhentian divers, Temple was my personal favourite, a straightforward pinnacle of rock that sits just off the shore, allowing a good current to pass through and providing both great viz and a headturning mass of different fish life. I was hoping against hope we might see an elusive guitarfish, which has been spotted both here and at the Tulumben Basi dive site, but no such luck: I had to content myself with schools of travally, fusiliers and jack whipping around us and a long line of squid propelling themselves single file over head, and finding a truly massive moray eel curled amongst the Pinnacle’s rocks. Divers are not limited to the Perhentians’ cluster of immediate sites though. If you have the time to spare, you should definitely take a speedboat trip from the Perhentians to Redang as well. Only 40 minutes away, most dive shops organise cheap trips with two dives and lunch included, allowing divers to be back mid afternoon. Palau’s deeper dive sites mean that the viz can be a lot clearer than the Perhentians, but the currents a lot stronger too – certainly that was my experience, and the dives we did at Batu Tokong and Turumbu Kili needed some concerted finning at times but were eminently worth the effort. There are some spectacular table corals on these sites which run into one another, creating an organic plateau that is quite mesmerising. The coral is also a big hit with the turtles, who we saw several times feasting on the reef. The Perhentians, then, offer a wealth of dive opportunities that are easy to get to and won’t cost a fortune. While diving at the Perhentians may not be as flat out spectacular like diving at, say, Sipadan, the islands have a particular charm both above and below the surface. 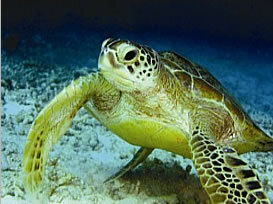 Many thanks to Turtle Bay Divers (www.turtlebaydivers.com/) on Perhentian Kecil for their help with writing this report. Most major airlines fly into Kuala Lumpur International Airport. From there domestic flights can be taken to Kota Bharu, the nearest town on the mainland to the Perhentian Islands. It’s a one hour taxi ride from Kota Bharu to the pier at the coastal town of Kuala Besut. Speedboats from the pier take about half an hour out to the Perhentians. Don’t bother with the mechanically unreliable slow boat. 27 to 30 degrees Celsius. The Perhentian Islands are a tropical island, and the temperature can rise to 34 degrees. Apply a lot of sunscreen and drink a lot of water. 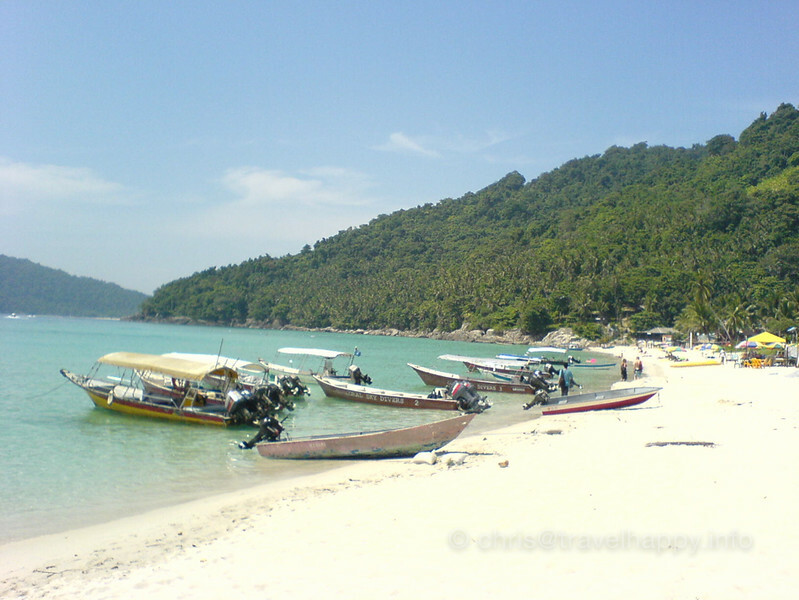 English is widely spoken in the Perhentian Islands as it is throughout Malaysia. Most accommodation on the Perhentian Islands is of the simple beach hut variety, with a couple of more luxurious resort-style places having opened up on Perhentian Kecil. Michael at SeaUndersea.com has written up a useful overview of his three days of diving at Tioman island just off peninsular Malaysia. Short version – he loved it! Borneo has long been known for the superlative beauty of its scuba diving. Home to thousands of different aquatic species, Malaysian Borneo’s islands boast a staggering range of biodiversity. Coupled with postcard-perfect tropical islands set amongst shimmering azure seas under the vast canopy of the Indo-Pacific sky, Borneo is quite simply one of the best places in the world to go diving. The large island of Borneo is geographically divided between three different countries – Indonesia, the tiny state of Brunei and Malaysia. Sabah and Saruwak are the two states of Malaysian Borneo. All of the dive sites mentioned here fall within Sabah’s jurisdiction and are therefore subject to Malaysian law and immigration requirements. Most European nationals can get a visa on arrival into Malaysia. 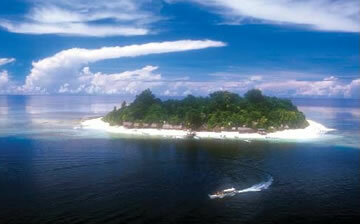 Sabah’s dive areas are focussed on specific islands which are located all around the state’s coastline. A holiday can be comprised of visits to two or three islands depending on what you want to do – whether you want a full on dive holiday, a romantic retreat or lots of non-diving fun to keep the family entertained. A good guidebook like Lonely Planet Malaysia and Borneo can give you full details of the wealth of non-diving activities available across the country. Whatever you decide to do, Kota Kinabalu will be your entry point into Sabah and from there you can hop to any of the other locations listed. Malaysia Airlines provide numerous comfortable and efficient flights from London to Kuala Lumpur and then onto Kota Kinabalu, Sabah’s capital city, as well providing an extensive network of internal flights throughout Borneo. Earlier this year the Malaysian government caused some consternation amongst the global diving community when they announced that all the diving operations based on Sipadan would have to completely shut down by the end of 2004. All building structures would have to be removed from the island so as to allow the island to return to its pre-tourism state. Given that Sipadan is one of the world’s most well-known dive destinations, famous for its sheer walls which plunge directly from the island’s tiny beach hundreds of metres into the depths of the ocean, there were fears that the shutdown order meant the end of diving at Sipadan itself. This is thankfully not the case. The shutdown order came about due to growing concerns about the damage tourists are doing to the island and the impact of human presence on the turtle population of the island. Divers can still come to Sipadan from Mabul or Kapalai, the two impressive reef-based resorts which are only a 10 minute boat ride away from the island. Pulau Sipadan, to give it its full name, looks like the original paradise island – a slash of gleaming white sand topped with verdant palm trees on the horizon, a tiny land oasis in the middle of the ocean, surrounded by the turquoise patches of coral reefs all around and set beneath a vast blue sky. The approach to this undeniably beautiful island makes for a glorious speedboat journey. Whilst there is an undeniable romance to staying on Sipadan itself, the facilities and accommodation on offer at the two nearby resorts are of a distinctly better quality and more suitable for non-divers. This quite bold move by the government is a welcome start in serious conservation of diving sites. Sipadan has continued to grow both in popularity and accessibility, thanks to its spectacular wall reefs where thousands of species gather to live and hunt. Given that Sipadan is effectively a finger of rock rising 600 metres from the depths of the ocean floor, it offers shelter and protection to manta rays, large schools of hammerhead sharks and occasionally whale sharks. These tend to be found at deeper depths – 30 metres and below – and the clarity of Sipadan’s water means that the light penetrates quietly easily to these depths, even if the warmth doesn’t. But for all Sipadan’s headline grabbing with what can be found further down its wall reefs, gentle tours at 10 metres by the side of the reef and over it can be equally rewarding. Here hundreds of turtles can be found nestled amongst coral, sometimes rubbing an itchy spot against a rock, then languidly making their way gracefully to the surface for a breather. Also lazing around are reef sharks, gathered in twos or threes, a little less than a metre long and looking like minature Jaws but perfectly harmless if treated with respect. 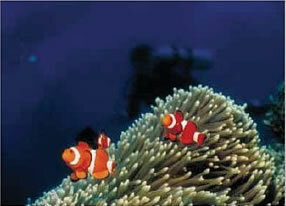 The Indo-Pacific is the most abundant oceanic region for aquatic life and Sipadan seems to be home for most of them. This sheer profusion turns any dive report into a long list of fish spotted – there are numerous species of lionfish here, resplendent in their delicate colours and quills contradicting the venom of their sting; shoals of shining barracuda; huge schools of jack who move simultaneously en masse to create a spectacular silver streak all around divers lucky enough to get in amongst them; endless brightly coloured tropical fish; and my personal favourite, the clown triggerfish, a puffa-fish lookalike with a black underbelly decorated with white splodges that look exactly as if they’ve been painted on by some whimsical fish god who was feeling slightly the worse for wear at the time. Divers don’t need to be experienced to dive at Sipadan, but feeling comfortable and confident in the water is important, given the depths and strong currents that can be encountered. Coming cold to Sipadan on a dive expedition is probably not a good idea – a few practise dives at Mabul or Kapalai, or elsewhere in Borneo, before diving Sipadan will let divers maximise their enjoyment and appreciation of its dive sites. There is something truly unique about diving at Sipadan – not just because of its wall diving, which let you peer into the abyss below, and not just because of the turtles who have made this their breeding ground. There is a feel, an atmosphere to diving at Sipadan that I have never encountered anywhere else. It’s a truly breathtaking dive experience and one that looks set to be enjoyed by many more people to come now that steps are being taken to protect Sipadan’s wildlife and coral reefs. Sipadan is certainly the apex of Borneo diving and a fitting climax to any dive safari.